Spain coach Vicente del Bosque admits his "drained" side face a disadvantage in their Euro 2012 semi-final with Portugal on Wednesday. Xabi Alonso's double earned Spain a comfortable 2-0 win over France on Saturday to set up a last-four meeting with their neighbours in Donetsk. Portugal booked their place by beating Czech Republic 1-0 two days earlier. Del Bosque said: "We have two fewer days to rest than them. It is a small handicap." Spain were comfortable in beating France, but Del Bosque revealed afterwards that his side are feeling the strain after reaching the semi-finals of a third consecutive tournament. "I am thinking about this problem," he said. "We have arrived very drained because the heat we suffered tonight was cruel on the players." After a lively opening which was capped by Alonso's excellent header, Spain slowed and were not at their best, but France only managed a single shot on target. Del Bosque - who again lined up without a recognised striker - praised his defence as they kept an 11th clean sheet in their last 14 games at a major tournament. 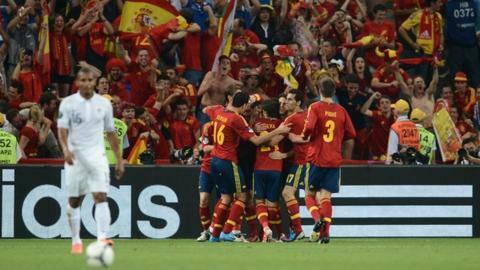 "The truth is we did well and controlled the game," said Del Bosque. "[Goalkeeper] Iker Casillas hardly had anything to do and that speaks of the good defensive performance of the team. "If our defenders are good then we will be closer to winning the tournament because we will always create a chance." Alonso - who was making his 100th appearance for his country - believes his side will have to be at their best to see off Portugal. His Real Madrid team-mate Cristiano Ronaldo is likely to pose the biggest threat to Spain reaching another final, with the Portugal forward scoring three times in his last two appearances. "At this stage all the games are difficult and we know Cristiano perfectly," said Alonso. "We have to concentrate on ourselves and try to play a game like today or even better."